Are you tired of blackheads and would want them to go away??? If you answer yes then my friends do keep reading! Then before starting the treatments let's know what they actually are and what cause them! What are blackheads? Blackheads are formed when the pores gets clogged by the excess oil from the sebaceous glands, bacteria with the dead skin, comes in contact with oxygen which turns them black. They appear like a small black plug on the areas where the sebaceous glands are over active. They are also called as open comedones. Blackheads if not taken care of can turn out in pimples or acne. Hormones is considered as the main reason there by making glands over secretive that may be easily taken over by bacteria. Hence, resulting in blackhead or whiteheads. 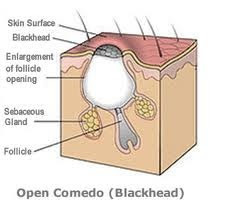 So, oily skin when not cleansed properly may suffer from these so called comedones or blackheads. Using certain skin care products can also lead to open comedones, especially the products that are not meant for oily skin types. Apart from these, there are some indirect causes responsible that may eventually lead to the formation of blackheads. The most common eruption of blackheads can be seen on the nose and chin. It’s always said that prevention is better than cure. So, try these things and keep a check so as to prevent them in the first. Wash your face with proper cleansers. Cream cleanser are for normal to dry skin so, choose a foaming or gel cleanser that should only take the excess oil away rather than stripping the natural ones. Try and avoid oil based skin care or make up products especially your foundation, make sure it is water based, light and won't clog pores! Do not sleep with the makeup on. This you may have read plenty of times but trust me the makeup that we use to feel and look good, if not removed properly that may start showing adverse effects and can also take a toll on your skin which would be the last thing you will want your makeup to do that for you! Always clean your face If you feel it’s getting oily or dirty no matter if that may exceeds the thumb rule of washing twice a day. Use plain water and pat dry!! Avoid oily and junk food if possible. It may have the the direct or so obvious reason but may be counted as one of the contributing factor! Exfoliate skin properly. When you exfoliate the dead skin is removed, skin feels refreshed and less likely to have clogged pores. Use face masks regularly than can help absorbing excess oil. Eat balanced diet and drink sufficient water.This is one of the first most thing which we should take care not only for healthy skin, hair nails etc but a healthy body!! Steaming- Steaming can help in unclogging the clogged pores and helps you to get rid and prevent blackheads. All you have to do is take a bowl with boiling water. Take a towel and like a tent cover yourself with face facing downwards towards the hot water bowl. Take care and do not hurt yourself while doing this. It is a home remedies that can easily prevent them and also makes the skin glowy and healthy by cleaning the pores. Though do not over steam your face. 3-5 minutes should be fine! Clay pack- Clay has proved to be excellent in absorbing the excess oil and keeping the skin oil free. You may use a clay pack twice a week or as per the requirements and preference! Clay masks in tubes are readily available in the market and so many brands have come up with their own version of oil absorbing clay packs or mask. If you want to do it yourself at home then take fullers earth and mix it with some water or rose water. Rinse when dry ! Exfoliation- Exfoliation helps getting rid of dead skin. Not only this they leave the skin refreshed and smoother. Natural exfoliators like honey and sugar mixed with lemon can give great results. Extraction- Blackheads can be taken out by using blackhead extraction tools which are quiet easily available. Make sure to extract them when the pores are open so that the process is easy and less painful. After steaming skin is said to be ideal for extracting them. You can use your fingers to apply pressure from both the sides but make sure not to use the finger nails as they can leave scars. After applying little pressure, use a sterilized blackhead extracting tool and try to take the blackhead into the loop and gently scoop it out. Remember to apply astringent to closes those pore. It appears quite simple but if not sure you should seek professional help!! Pore strips- Using pore strip can be an easy method to take them out. Read the instructions carefully and it can be a little painful. Most if these strips come with a defined set of instructions with a simple idea to wet the affected area and place the strip. wait for sometime and then peel it off. If you are not sure whether you can take them properly or regarding using the tools, seek the help of a professional. Great article which has written in simple language n clearly. Yes, Blackhead is a common problem n people are searching home remedies for it. Thanks for sharing, keep writing the tips. Simple language can help people to understand it better. I had suffered from both blackheads and whitehead a couple of years ago. Great article Niesha, will follow them as blackheads are a regular problem on my oily skin. Thank you Neha.. I had few of them and lots of whiteheads. Thank you Ramya.. well not directly but indirectly it may since whenever i eat oily and spicy food it reflects on my skin and when some of my friends have the same oil laden food, still no probs. So, i think it may depend individually. This was such a helpful post. Thank you Vish..:) even i do that sometimes, it saves time. I use pure tea tree oil neat to the blackhead. I apply a drop of tea tree oil to my finger and rub it directly into the blackhead morning and night. In a few days it comes right out. All I have to do is use my thumb and index finger to gently pull the entire thing out. Don't worry the smell of the tea tree oil only hangs around for a couple of minutes.